Universal group of institutions was opened in 2009 and since the past decade, the college has provided the best talents to the nation and process is still on. Students from various parts of India are coming here for higher studies and lots of them are now settled in multinational companies. All graduation and post graduation courses are being provided by the institution and MBA is one of them. MBA means masters in Business Application and students who want to set up their carrier in the management department of corporate sectors can go for the course. Theexcellent result has been given by the college hence they are one of the reputed MBA College in Chandigarh. The college has introduced this course with a motto to create best managers who can manage the professionally as well as personally. Here we teach the concepts of management based on professional content and also with that management of society, management of life, management of time, etc also been taught. 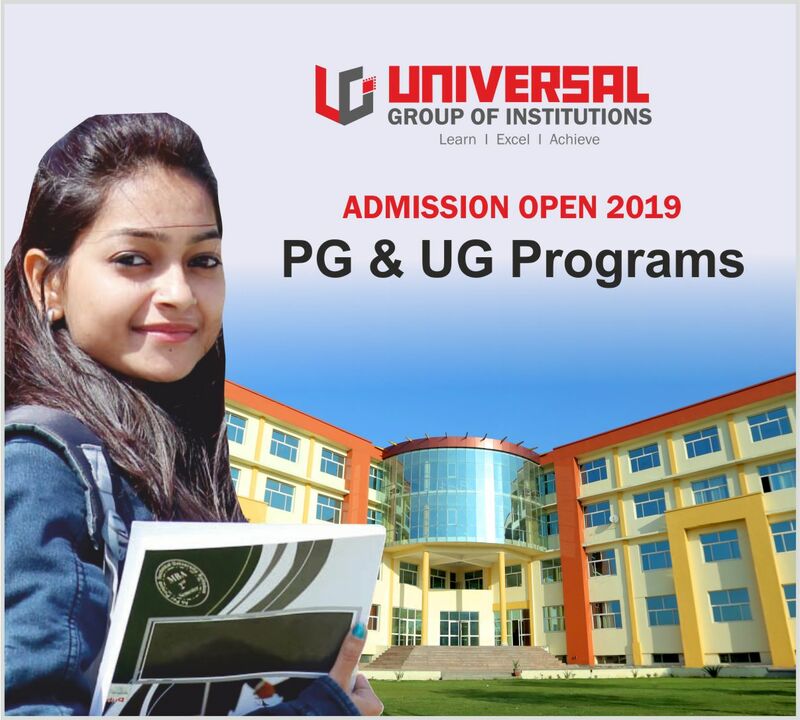 So to get a fully fledged knowledge check out all the details at the web portal of Universal group of Institutions and we are sure that your search for MBA College in Chandigarh Punjab will stop here only. The College focuses on various programs in order to provide proper content to an individual because we understand the value of time of a student which he or she is giving here also the expectations of the family members. Hence if you are still browsing for the MBA College in Chandigarh then go to the website of the university and see what our past students speak about us? You will be really surprised by seeing the hard work of the management and as a result of which Universal group of institution is the golden name in the best MBA College in Chandigarh Punjab. Business Application Software laboratory: A well maintained and equipped labs are designed to provide proper knowledge to the students so that they could be demonstrated in a practical way. Communication Skills Laboratory: Communication is something which plays a very important role in one’s career. We understand the value of it and hence emphasize more on the same. Placement cell organizes various tests in order to improve the communication and it is done in the laboratory itself. Group Discussion and Business Debate Workshop: Various workshops are organized by the college so that people could get aware of the current business module. Where the economic condition is moving? What is the current business model? These kinds of discussions are carried out and we also organize debates to increase thinking ability of an individual. Audio Video theatre: To enhance the listening and understanding skill, audio video theater has been placed through which a student can create a visual of the story and understand the things as per the mindset. From all these activities you can understand the contribution of the universal group of institution towards the career of students and that is they are the best MBA college in Chandigarh Punjab. MBA that is Masters in Business Application is of 2 years course. Those students who have completed their degree of bachelor can apply for the course of MBA. The bachelor’s degree should be from any of the reputed colleges. MBA finance: If an individual is having interest in finance sector where he will be required to check all finances (incoming and outgoing funds) of the corporate, then he or she can complete the Masters in finance. This is one of the demanding sectors as per the current market figure. MBA Marketing: Marketing means promotion. So the persons who are willing to promote the products or services of any organization can go for MBA marketing. People must have excellent convincing power and communication skill in order to get the best results. MBA HR: It means, MBA in Human Resource. This stream deals with the supply of resources to the organization. Like HR of an organization is responsible for the hiring of staff, firing of staff, salary management, etc. hence those who have administrative power and can work like this, then they can opt for MBA in HR. If we discuss for career opportunities then, by doing MBA one will have a chance of becoming a Project Manager, General Manager, HR Manager, CEO that is Chief executive officer, Business Analyst, Management Consultant, Senior Product Manager, etc. The universal group of institution is aware of all these key concepts and you need to check out all the details for MBA college in Chandigarh Punjab.